AFL’s new FAST Connectors are pre-polished, field installable connectors that eliminate the need for hand polishing in the field. 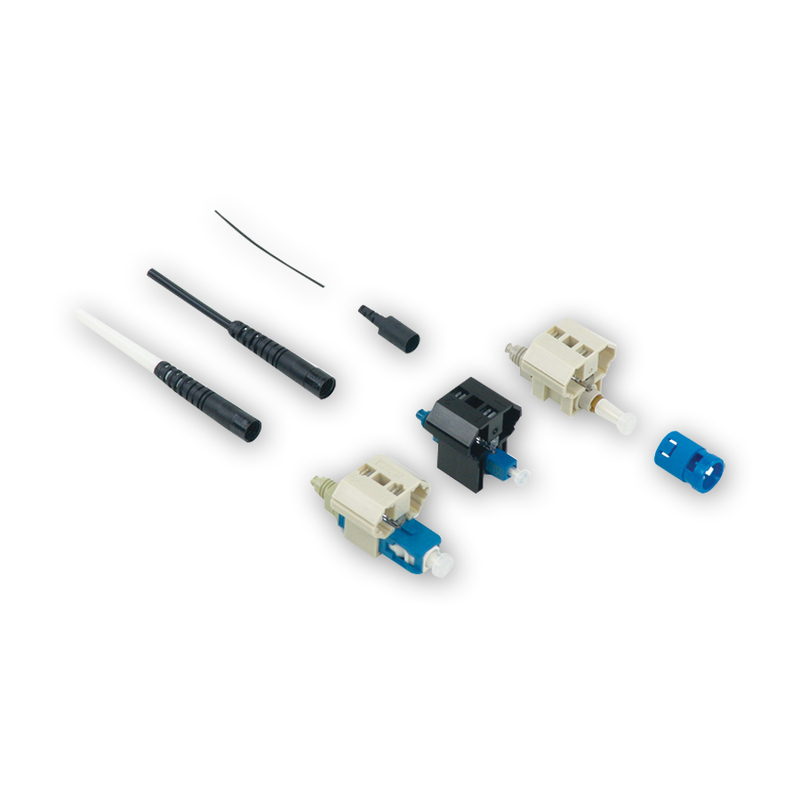 FAST Connectors provide an immediate termination to either single-mode or multimode fibers. 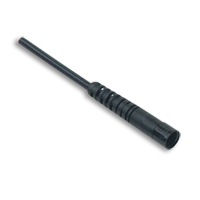 FAST Connectors feature a pre-stubbed factory-polished ferrule that couples to the fiber being terminated by precision mechanical alignment, insuring low loss with a proprietary gel. Each FAST Connector comes with a factory-installed wedge clip that holds the clamping device open while the fiber is inserted. Once the fiber is in place, the wedge clip is removed and discarded. Installation takes just minutes and couldn’t be easier. Strip the buffer, cleave and insert the fiber into the Fast Connector. Release the wedge clip...you’re done! Gone are the expensive tools, jigs and messy epoxy. FAST connectors are pre-packaged with 900um connector packs only. 2mm and 3mm boots can be purchased separately. I had to repair some fiber connections for a video display and I had watched a technician install these and felt I could do this. I purchased these connectors and the required tools and with no experience other than knowing the basics about fiber optics I was able to install these connectors with very little effort. The most important part is to ensure the cable get properly prepared prior to installation. As long as you remove everything down to the core the connector slides on very easily and makes a good connection. I would highly recommend these to anyone with basic knowledge that needs to connect fiber. Q: What are the differences between the CT-30 and the CT-05 cleavers included in the FAST Connector tool kits? A. The CT-30 fiber cleaver has a 16-position blade that yields 48,000 single-fiber cleaves, or 4,000 12-fiber ribbon cleaves before requiring replacement. The CT-30 cleaver is the same cleaver used by AFL for the factory-cleaved side of the FAST Connector. The CT-05 is designed for single-fiber cleaving only, but still yields up to 48,000 cleaves. The CT-30A and the CT-05A are to signify that the tool comes with an adapter plate used for measuring cleave lengths required for the FAST Connector termination. Q: Why am I getting high-loss when terminating FAST Connectors? A. High loss is yielded while terminating FAST Connectors due to poor fiber insertion. If the fiber was broken inside the connector, a new connector is needed. If a fiber was not broken inside the connector, the FAST Connector can be re-terminated up to 3 different times*. Place the wedge clip back onto the connector with the "1" on the wedge clip facing the ferrule and push until a clip is heard to reengage the wedge. You may then re-terminate your fiber. A good cleave is the most important factor in getting a good termination. Re-cleave before re-inserting the fiber into the connector. If the above does not provide a solution, rotate the cleaver blade. Reinsert the fiber, making sure to create a slight bend in the fiber before releasing the wedge clip. If issues persist with high-loss after trying to re-insert the fiber three times, contact AFL technical support. *The FAST ST Connector may be reused prior to application of the housing to the connector body. After the connector housing has been applied the design is no longer reusable. Q: Why am I unable to insert the fiber into the connector? A.Sometimes the wedge clip comes disengaged during transportation. If so, the installer will be unable to insert the fiber into the connector. To properly engage, squeeze the top and bottom of the wedge clip. If it disengages, you will hear a click. If the fiber is cleaved too long (greater than 10.5mm) the clamping mechanism of the mechanical connector will not clamp to the appropriate parts of the fiber, resulting in an improper insert. In this case, installers should strip, clean, cleave and reinsert the fiber. Q: Why is the VFL not working? A. The VFL may not be working for several reasons. If the fiber was inserted incorrectly this would be cause for the light to not dim properly. If a fiber is broken inside the connector, the connector itself will be unusable and the VFL will not to work. Always remember that the VFL capability of the FAST connectors is to be used as a verification tool, not a validation tool. The tool is useful as a double check after creating a slight bend in the fiber, but should not be the only step used to confirm that proper termination has occurred. If problems persist when terminating FAST Connectors while using a VFL it does not signify a bad connector without proper loss test results to prove a bad connection has been made. Q: What is the index of refraction over temperature? A. The refractive index is 1.469 at 25°C with a thermo-optic coefficient of less than 4.0 x 10-4/°C. Q: How do you prevent the gel from drying out inside of the connector? A.The gel has a low evaporation rate. Index matching gel within FAST Connectors has a shelf life of 20 years. Q: What prevents the gel from migrating away from the fiber? A. The upper body of the mechanical splice mechanism is designed such that the surface area clamping onto bare fiber is minimized, and prevents the gel from migrating away from the splice point.